What motivated you to start Passport Admissions? Starting Passport was a happy accident. For almost a decade, I taught MCAT prep (and trained instructors) for The Princeton Review. Along the way, students started asking me for help with their application essays. Pretty soon, the trickle of essay requests turned into a flood, and my boss lovingly kicked me out, telling me to start my own business so that I could help more students. Ten years later, we’re still going strong. How long have you been helping pre-medical students gain admission into medical school? How did you discover this profession? You may have noticed that I’m not a doctor. I never will be. I haven’t taken a science class since high school. Blood makes me nauseous. And yet I help students get into medical school. What gives? I think the answer starts with this: I love solving huge, hard problems. I loved the game of beating the MCAT, but even moreso, I love helping students figure out the bigger problems in their lives: how to distill their essence into a personal statement, or how to spend their time to make them happiest and most successful. Students often overlook these issues on their quest to achieve perfect scores and an impeccable pre-med checklist. Helping them redefine and improve their approach is endlessly fascinating to me. I also bring a skillset that most pre-meds don’t have: I love to write and I love to present. I was the captain of the debate team in high school and president of an a cappella group in college, so writing and performing are second-nature to me. Whether it’s writing essays or practicing interview responses, much of the application process is learning to present yourself well, and I believe I’m an expert at that. What captivated you about the medical school admissions process that led you to working with pre-medical students? Well, he didn’t get in. Looking back, he had some problems with his application: a mediocre undergraduate GPA and a low MCAT verbal score. It also didn’t help that he and I screwed up the application process: he applied to far too many schools, he got completely overwhelmed by secondary essays, and he didn’t follow up with the schools on his list. The good news is that he applied the next year and got in. Applying well matters, and I was determined to help others avoid the mistakes my first student made. What has been the most rewarding aspect of working with pre-medical students? Easy. It’s the phone call, from the student who never thought they had a chance when they first started working with us, but who finally got into medical school after so many months (or even years) of working together. I love how humble and hardworking pre-meds are. Our students are amazing, and they motivate me to be the best advisor I can be. You run a phenomenal pre-medical blog called The Savvy Pre-Med. What motivated you to start this blog? Back in 2013, I was searching for resources online for my students. I scoured the internet for good pre-med blogs, and I didn’t find anything that I liked. Most of the advice was typical - good grades, good MCAT, yada yada - but I didn’t see much that discussed how to stand out. How do you reach your full pre-med potential? That question inspired me to put our best advice on display, for free, in a way that was helpful to the bigger pre-med community. I sincerely hope we’ve served that purpose. What is the best part about running a pre-medical blog? Washing dishes: sponges or brushes? A play-by-play of every Michigan loss for the past decade (okay, so maybe the readers of this blog might like that one). You get the idea. The application to med school is just a form on a website, and there are only so many ways to make that interesting. Surprisingly, I find that challenge enjoyable. How can we find the elements of our humanity in the application process? How can I challenge our readers to become better at what they do and learn to stand out? That’s the best part of running a pre-medical blog. Passport Admissions also participates in community outreach. What is your favorite way to get involved in the community? I love giving presentations about the admissions process. My favorite is called “11 Ways to be a Remarkably Average Pre-Med,” which challenges pre-meds to figure out how they can stand out in the application process. We offer this presentation for free, because we want to get great information out to the community. If your student organization needs a speaker about the admissions process, drop us a line. We are also the only medical school admissions company to offer a free, hour-long introductory meeting to anyone. Part of our motivation here is selfish: we want to interview prospective students to make sure they’re a good fit. But it also helps the community by allowing pre-meds to learn their chances of getting in and what they need to do to pursue this dream. What did you major in as an undergraduate? Why did you choose it? How did it play a role in your choice of profession? I was always meant to be a lawyer. My father’s a lawyer. Three of my best friends are lawyers. I was captain of both the debate team and mock trial team in high school, majored in political science at Michigan, but after taking my LSAT, I decided I didn’t want to go to law school. I realized that I didn’t like conflict and paperwork, the two things lawyers deal with most. The next few years were hard, not knowing what I wanted to do or be. No longer on a professional “track,” I had to figure out what I enjoyed: helping students overcome their educational obstacles. At Princeton Review, I got to be a teacher without giving a grade, and I loved it. Both disciplines require using evidence to make arguments, which is what the best pre-meds do in their resumes and application essays. My background tested my writing and speaking skills, which I now teach to pre-meds. What was your favorite aspect of your undergraduate experience? The football team was 3-1 against Ohio State. I loved how many things I could do at Michigan. I could major in political science and take unlimited music classes on the side. I could be the president of an acappella group and teach for The Princeton Review. At a school like Michigan, there’s so much opportunity to do whatever the hell you want. It’s pretty awesome. Pre-medical students often find themselves stressed out about the fast-approaching admissions process. What would you say to them? Try not to think about the application process until the last minute. The less you think about it, the less stressed out you’ll be. You’re busy, so use that as an excuse for why you don’t have time to work on the application process. Definitely compare yourself to all your friends and roommates. Nothing will make you less anxious than comparing your application credentials to a bunch of Type A overachievers with better grades and MCAT scores than you. Blindly apply to 50 or 60 schools to hedge your bets, but don’t do any research about what these schools actually look for in their students. Hope like hell that you get in. Who needs a plan? Just apply and see what happens. Okay, okay. Enough poking fun at poor stressed-out pre-meds. The most important thing for tackling application anxiety is to rip off the band-aid and make a plan for everything that’s coming your way. Figure out where you stand, what your strengths and weaknesses are, and what you need to do for the next year or two to get in. What is the best way for pre-medical students to stay organized and on top of the admissions process? It’s wise to find someone who will hold you accountable for the admissions process. Otherwise, you will put it off and make mistakes because you have to rush through the process. Either find a trusted mentor or pre-med advisor at your college, or find an independent counselor. The application process is too important to go alone. What are medical schools looking for in potential students? I’ll tell you what they aren’t looking for: goats. I know that doesn’t make sense, so bear with me. Goats are actually quite intelligent. They live in complex social groups, jump on trampolines, and plot complicated escapes from their holding pens. You can spend hours on YouTube finding videos of interesting things goats can do (and indeed, I did). Put goats in a herd, though, and they stampede just like any other pack animal. They all race to the same place, and in the end, they all look the same. The advice, then, is to maintain your interests outside of medicine. Pursue excellence, no matter the field it’s in. Give yourself time (you’ll need it if you’re going to stand out). Take a gap year or three. If you’re not going to be the biggest or fastest goat, then you only have one other choice for getting into medical school: don’t be a goat in the first place. What is the best method for determining which medical schools to apply to? Guy #1 is hitting on anyone who’s in front of him, and when he gets turned down, he starts talking to whoever he finds next. Guy #2 is more subtle. He’s picking his shots, selectively engaging and disengaging with different people, flattering and conversing only with those who seem interested. So, who’s your bet? Guy #1 or Guy #2? Most pre-meds reek of desperation in their school lists. They apply to 25-30 schools without considering what they have to offer the schools on their list, or what those schools consider important. They end up looking a lot like Guy #1, and as a result, they hurt their chances. How and when can pre-med students enlist the help of Passport Admissions when applying to medical school? Most of our students come to us about six months before they’re ready to apply to medical school to get help with the whole shebang: personal statement, school list, secondary essays, etc. We also work with undergrads as early as freshman year to help them develop a four-year plan, both for their courses and for figuring out how to stand out in the eyes of medical schools. We don’t take just anyone who wants to work with us, though. We turn away 60% of the students who seek our help, focusing on students who are a good fit, who will actually follow our advice, and who, with our help, can get in to a great med school. That’s why we are the only medical school admissions consulting company to offer a free, hour-long introductory meeting. We’ll talk about where you stand, what you need to be doing, and - if we decide you’re a good fit - we can tell you more about our services. 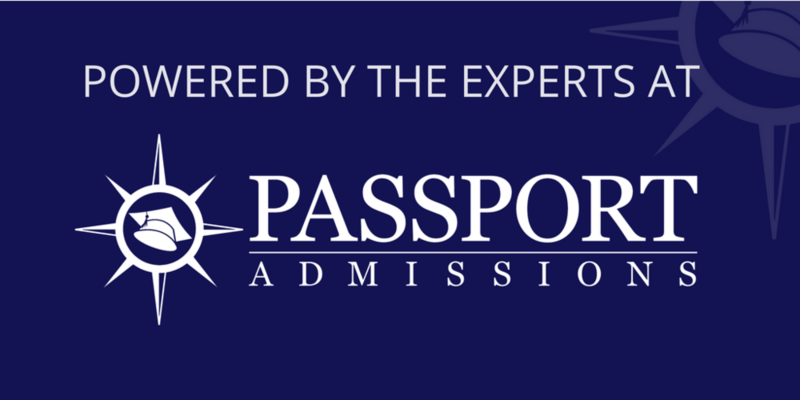 What are your plans for the future of The Savvy Pre-Med and Passport Admissions? To become the best pre-med blog on the planet, and the best admissions consulting company possible. Best doesn’t mean biggest. Best to us means knowing and serving our students - pre-meds with personality - better than anyone else. We also hope to develop more audio and video content for our blog, so stay tuned. What is your number one piece of advice for pre-medical students? Don’t just follow the herd. Checking off all the items on the pre-med checklist - good grades, volunteering, clinical exposure, leadership - merely makes you qualified to get in. It doesn’t get you in. Why should a medical school accept you over all the other qualified students in the applicant pool? Mull the answer to that question, and find a way to be different from the pack. Did you watch this year’s Ohio State vs. Michigan football game? That’s like asking pre-meds if they ever have anxiety. Of course! I will swear to my grave that J.T. Barrett did not get that first down. After so many years in the football wilderness, Michigan seems to have returned to form, but it won’t be complete until we beat an Urban-Meyer-coached Ohio State team. I think Michigan is a little too thin on the offensive line and on the defense to come into the game a favorite (even at home), but I do think Michigan has a solid chance to break the streak this year.